This farthest middledalmatian island is very special. Besides being geographicaly isolated (it takes two and a half hours by ferry from Split to Vis), for almost fifty years it was the military base of the Yugoslavenian army and closed for tourists. The nature of Vis island remained almost untouched by mass tourism typical to more known and closer to the coast islands like Brač, Hvar or Pag. In 2003, the World Wildlife Fond (WWF) proclaimed Vis one of the 10 most preserved mediterranean islands. This time we've chosen 4 reasons that make Vis an ideal destination for your summer holiday. 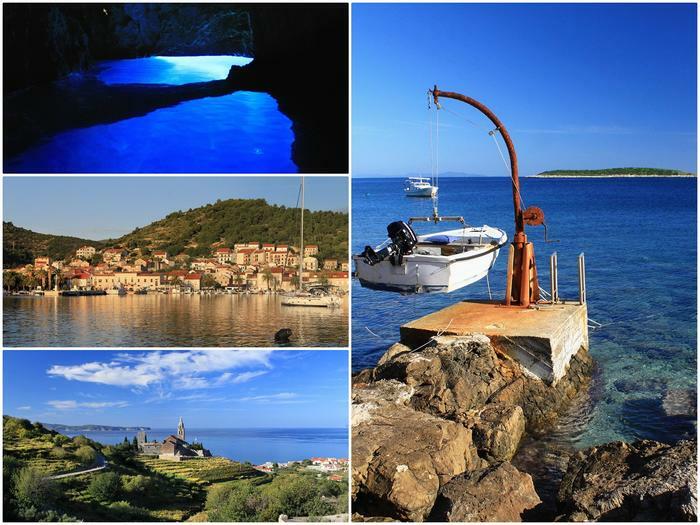 Book an apartment or room on Vis and experience firsthand this magical island. resting on the beach a sense of privacy because they're always being photographed. But Vis is full of other beautiful beaches. The eastern coast of Komiža canal is home to numerous pebbly beaches like Gusarica, Nova Pošta and Velo Žalo. In the city of Vis, take a swim on the pebbly city beach Prirovo or go to any of the sandy beaches in Vela Smokova, Milna, Zaglav and Stončica coves, if you are a family with children. On the south side of Vis there's another island pearl - Biševo. The eastern side of this little island hides the world famous Blue cave. As its name suggests, the cave is overwhelmed with a dark blue hue that makes such a mystical atmosphere. That phenomena is due to the sunrays that reflect on the cave's bottom and color the water blue, while objects in the water remain silver. This unique phenomena is best visible around noon. Hop on a boat in Komiža that sails several times a day. Equally attractive and breathtaking is the Green cave on the southwest side of the little island of Ravnik. You can get there by frequent boat trips from the Rukavac cove on Vis. The cave got its name from the green reflection made of green algae that live at the bottom of the sea. Tired of your fastpaced lifstyle, stress and fast food? Leave all that behind and come to Vis where you'll bathed in sunshine and invigorated with homemade seafood charge your batteries. Instead of fast food, try out some local specialties like octopus patties, lobster, marinated grilled fish and Vis bread. Water these tasty and fresh dishes with authentic wines from Vis - Vugava and the world known Plavac mali. For an island this small and faraway, Vis has a distinctively rich history. During antiquity, it was first a Greek then Roman colony. Afterwards, Vis' rulers were for a time even the Venetians, while the British and Austrian rulers fortified the island with its fortresses that even today stand as a monument to Vis' stormy and peculiar history. The past also left its traces in Vis' language, hardly understood by other speakers of Croatian, where you can find many words borrowed from Italian, German, English and even Hungarian. History lovers should visit the Archeological museum in the city of Vis (in an Austrian 19th century fortress) that keeps a collection of over 600 greek amphoras and the bronze head of the Greek goddess Artemis. Beside that, you can also visit remains of the greek colony of Issa, below the Gradine hill, on the north side of the island. The city of Komiža on the west side of the island is home of the Fishermen museum in a 16th century Venetian fortress.